McRae Imaging was tasked with accurately conveying the prestige and heritage of the Tennis Canada brand throughout their newly created office space. Tennis Canada has been promoting and supporting tennis for all ages as a non-profit organization since 1890 and continues to manage one of the oldest tennis tournament in the world. The organization wanted the rich history of the brand to be reflected throughout the office. To determine how to visually share the sport and history of tennis in Canada with the public through simple and elegant imagery. To use heritage photos from the archives that were in poor condition but showed great moments in tennis history. To stay within pre-existing budgetary restraints. The McRae team worked collaboratively with Tennis Canada’s marketing team on the design, dimensions and overall look of the timeline to create a meaningful and esthetic way to share the tennis story from 1890 to present. 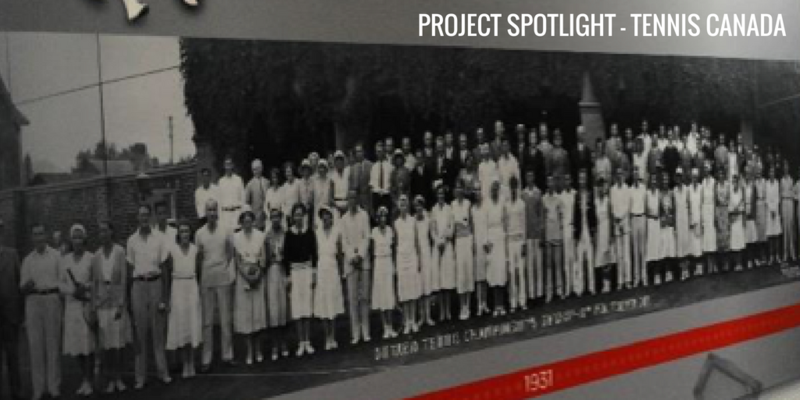 Pictures, memorabilia, and artifacts were collected from various offices, basements and storage and itemized to create a visual timeline which emphasized the full history and contribution that Tennis Canada has made over the years growing the sport. One of the biggest challenges for McRae was the condition of the old photographs. Some of the photos were literally crumbling out of the frames or scanned years ago for preservation but at very low resolution. Buy Levitra online from http://www.trendingdownward.com/generic-levitra-cheap/ by canadian licensed pharmacies. McRae’s imaging expertise allowed for certain must-have moments in tennis history to be chronicled. McRae’s CEO, Bob Murray states “Our industry knowledge, coupled with our in-house graphics, sewing, fabrication and lighting capabilities ensures the customer experience is seamless. We loved being able to help and support this project”. The collaboration between Tennis Canada and McRae resulted in a stunning, credible illustrative history of the sport that elevated their offices to reflect their true brand while remaining within their budget. The imagery of the old and new photos appear almost lifelike on the fabric. When asked about the project, Tulla Bateman, Chief of Staff and VP of Fundraising, stated “Working with Bob and his team of experts to deliver a high-quality vibrant art/conversation piece for the office was a great experience. The pictures virtually leap off the fabric. We now include the offices in our stadium tour rather than blocking them off”. 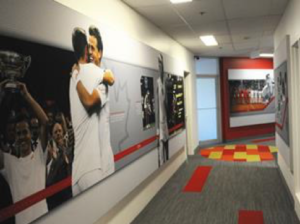 Tennis Canada’s offices are now beautifully decorated with an art piece that reflects their story, efforts, and contribution as well as their reputable brand.